Have you ever had the opportunity to talk with someone that you have looked up to for a long time? What would you ask them? What would you talk about? Recently I had the opportunity to do just that…my guest and I talk about fear, business and how to prosper with purpose. Ray is a copywriter by trade (meaning he writes sales copy, so don’t ask him how to copyright your new widget). He has worked with some of the most powerful voices in leadership and business including New York Times bestselling authors Jack Canfield and Mark Victor Hansen (Chicken Soup for the Soul), and Tony Robbins. He is also a speaker and author, hosts my favorite podcast, wrote the #1 Amazon Bestseller Writing Riches, and a good friend. Next week’s episode is Episode 100!!! Join us next week for a special celebration episode of the World Changer Show…Including appearances by several past guests from the first 100 episodes! You definitely don’t want to miss this episode! Question: If you could talk with anyone in the world, who would it be? You can leave a comment by clicking here. You and I work with other people every day. There is very little that we do in our lives that doesn’t require us to interact and collaborate with other people. In today’s interview I talk with two people who are focusing on how to help each of us work and think with people who think differently. Dawna Markova, Ph.D., is the CEO emeritus of Professional Thinking Partners. Internationally known for her research in the fields of learning and perception, she is a former senior affiliate of the Society for Organizational Learning, originated at MIT’s Sloan School of Management, and the co-author of the international bestseller Random Acts of Kindness. Angie McArthur is a senior partner of Professional Thinking Partners, and since joining the company in 1998 has co-facilitated and designed global conferences, leadership retreats, training programs, and ongoing one-on-one Thinking Partnerships in organizations from non-profits to Fortune 500s. Angie has also worked extensively with youth as part of PTP’s sister company SmartWired, developing materials, interactive websites, and programs around the world in multiple languages, and recently co-authored the parenting book I Am Smart. In Episode 99 we will be sharing an interview with one of the people that I’ve looked up to for quite some time. It’s a great interview and I know you won’t want to miss it! Question: What is one thing you can do today to collaborate better with others? You can leave a comment by clicking here. Today’s episode is Part 2 of a 2-part series on How to Overcome Burnout and Enjoy Your Life Again. You can listen to Part 1 here. Today we are going to talk about the ways 5-8 to avoid burnout. This topic is one that many people will relate to. It’s a strange, and somewhat terrifying experience when you realize the things that used to bring you so much joy are now literally sucking the life out of you. This episode came out of a conversation that I had about a year ago with my co-host, Mark, when he was still working a full-time job and trying to build a business on the side. He was the definition of “burning the candle at both ends” and he was approaching burnout. The suggestions we talk about in this episode (and Part 1 last week) are the ways I gave Mark to overcome his feelings of burnout and enjoy his life again. Episode 98 is an interview with Dawna Markova and Angie McArthur about how to collaborate effectively in their business and personal lives. If you interact with other people (and everyone does…), you won’t want to miss this episode! Question: What is one thing you will do this week to overcome burnout? You can leave a comment by clicking here. Have you ever felt burned out? I mean, really burned out — you wake up tired, you go to bed worn out and the rest of your waking hours are filled with anxiety, irritability and a feeling of hopelessness? In today’s episode we’ll share 4 ways to overcome burnout and start enjoying your life again. Today’s episode is Part 1 of a 2-part series on How to Overcome Burnout and Enjoy Your Life Again. Today we are going to talk about the first 4 ways to avoid burnout, and in Part 2 we’ll talk about ways 5-8. This episode came out of a conversation that I had about a year ago with my co-host, Mark, when he was still working a full-time job and trying to build a business on the side. He was the definition of “burning the candle at both ends” and he was approaching burnout. The suggestions we talk about in this episode (and Part 2 next week) are the ways I gave Mark to overcome his feelings of burnout and enjoy his life again. Eliminate something from your schedule, NOW. Create a daily ritual with your family (or friends, or self). I share what my daily ritual is with my family. Episode 97 is Part 2 of this 2-part series on Overcoming Burnout. If you’ve ever felt burned out, worn out or just beat down by life, you won’t want to miss this episode! Question: What are some ways you have overcome burnout? You can leave a comment by clicking here. Do you remember where you were when you heard Robin Williams died? The whole world was in shock…this seemingly happy, joyful person we all loved had silently been hurting and was in pain. How many people do you know that might be silently struggling? In today’s episode I talk with someone who has dedicated his life to helping those who struggle. Jamie’s transition from surf company salesman to Non-Profit leader. Today’s guest is the founder of To Write Love on Her Arms (TWLOHA), a non-profit movement dedicated to presenting hope and finding help for people struggling with depression, addiction, self-injury, and thoughts on suicide. TWLOHA has one of the largest online audiences of any non-profit (2.5 million) and he has been interviewed by NBC Nightly News, CBS’s Sunday Morning, and Rolling Stone magazine, among others. He is the only non-musician to win an MTVU Woodie Award. He speaks frequently, telling the TWLOHA story and encouraging audiences at universities, concerts and music festivals. In Episode 96 we talk about something that is all too prevalent in today’s society…burnout, and how to overcome it. If you’ve ever felt burned out, worn out or just beat down by life, you won’t want to miss this episode! Question: How will you tell your story this week? You can leave a comment by clicking here. Why do you think the way you do? Why do you act the way you act? Why do you do everything you do? Do you know? Does it matter? Well today’s guest will explain why it is vitally important to figure out why you exist…and how to express it. Author and International Speaker, Ridgely Goldsborough, believes in taking complex and challenging issues and making sense out of them. He started his first business at the age of 16 and after graduating from Law School in 1987, has founded 43 companies. He has written 11 books, hosted his own television show and created dozens of audio and video programs on success and prosperity, and conducted dozens of online marketing campaigns. Ridgely is the co-founder of the WHY Engine, the revolutionary marketing and messaging program used by professionals worldwide to attract ideal clients based on the company’s WHY (and I might add, not just companies but this is powerful for individuals as well). FREE BOOK: Who Will Change the World, If Not the Entrepreneur? Question: What is your why? You can leave a comment by clicking here. Episode 093: I Hate My Job, Now What? Have you ever had a job you hated? I mean REALLY hated? Are you in you in it now? Well in today’s episode, we’re going to talk about how to leave a job you hate using the power of a great network. He is the author of Project:Success, which climbed to #3 in the Self-Help category in the Amazon Kindle Store as well as Start a Conversation with Anyone, Anywhere. He is also the co-founder and former co-host of the Happen To Your Career Podcast and the current co-host of this podcast, The World Changer Show. Mark is passionate about connecting with others, finding ways to add value to them and helping other people do the same. Text CONNECTOR to “33444” to enter to win a FREE Copy of Judy Robinett’s book, How to Be a Power Connector or Click Here. Question: What one action have you delayed taking that you need to take today? You can leave a comment by clicking here. Are you living up to your full potential? If not, why aren’t you? Odds are, you have unknowingly developed habits that are actually holding you back. In today’s interview I talk with someone who has learned how to recognize, confront and overcome these damaging habits. Today’s guest is named one of the Top 100 Women to Watch in Wellness by Mind Body Green, and labeled a modern thought leader on the rise by Café Truth. She is an inspirational author, speaker, travel writer, and life coach who left her successful career in advertising to follow her heart and be a writer and the best selling author of Find Your Happy, Find Your Happy Daily Mantras, and the new book, Adventures For Your Soul: 21 Ways to Transform Your Habits and Reach Your Full Potential. Text ADVENTURES to “33444” to enter to win a FREE Copy of Shannon Kaiser’s book, Adventures for your Soul or Click Here. In Episode 93 we talk about something that is all too prevalent in today’s society…burnout, and how to overcome it. If you’ve ever felt burned out, worn out or just beat down by life, you won’t want to miss this episode! Question: What makes you joyful? You can leave a comment by clicking here. We live in a noisy world. It has never been easier to express your thoughts, opinions, or even what you ate for breakfast. The problem is, billions of other people are doing the same thing. So how do you stand out amid all the noise and chatter…well that’s what my guest and I talk about in today’s episode. What is your “authentic voice”? Do you find or develop your voice? The steps of developing your voice. Todd’s favorite person he’s interviewed. Todd Henry is the founder of Accidental Creative, a company that helps creative people and teams generate brilliant ideas. He regularly speaks and consults with companies about how to develop practices and systems that lead to everyday brilliance. He is the author of three books: The Accidental Creative, Die Empty and his new book, Louder Than Words: Harness the Power of Your Authentic Voice. His books have been translated into more than a dozen languages, and he speaks internationally on creativity, productivity, leadership, and passion for work. Text AUTHENTICVOICE to “33444” to enter to win a FREE Copy of Todd Henry’s book Louder Than Words. In Episode 92 I interview Shannon Kaiser about her new book Adventures for the Soul: 21 Ways to Transform Your Habits and Reach Your Full Potential. We talk about the importance of being true to yourself and finding what makes you happy. Question: Why do you think it’s important to develop your authentic voice? You can leave a comment by clicking here. When you experience pain, what do you do? How do you react? Do you avoid it at all costs? Or do you, embrace it, use it to propel you to greater success and accomplishments than you ever thought possible? Today we talk about how a single African tribe has come to totally dominate the running world, and what it means for you. In the world of running, as of a few years ago, 5 American high school runners had ever broken the 4:00 mile…one high school in this Kenyan tribe (the Kalenjin Tribe) had 4 breaking a 4:00 mile at the same time! Seventeen American men in history have ever run a marathon under 2:10:00…32 Kalenjin men ran that fast in a single month recently. What is it about this tribe that has led them to dominating the world of running…and why does it matter to you? We talk about this and more in this episode. POST: Are You Truly Passionate About The Things That Matter Most? On Episode 91 we have an interview with Todd Henry about his book, Louder Than Words: This was one of my favorite interviews, don’t miss it! Question: How have you used pain to push you to success? You can leave a comment by clicking here. What will the number 1 job be 20 years from now? Do you know? Odds are it hasn’t even been thought of yet. So how do you prepare for it? In a world that is changing so rapidly how do you ensure that you will be able to make a living–let alone change the world. In today’s episode we interview a man who has made a career out of adapting to our ever changing world. What is disruption, and why is it important? Today’s guest is a dynamic entrepreneur and intrapreneur who is widely recognized as one of the world’s leading experts on disruption and innovation. He launches billion dollar businesses, transforms entire industries, revamps government institutions, and for over three decades continues to be at the forefront of global trends. He has worked with companies such as Linkedin, eBay, Sony and Universal Studios. He’s an adjunct professor at the University of Southern California, a sought after speaker and consultant and is often interviewed and quoted on major television networks and in major publications, both online and in print. He’s the author of Disrupt You! : Master Personal Transformation, Seize Opportunity, and Thrive in the Era of Endless Innovation. JAY’S BOOK: Disrupt You! : Master Personal Transformation, Seize Opportunity, and Thrive in the Era of Endless Innovation. FREE BOOK: Who Will Change The World If Not The Entrepreneur? Text DISRUPT to “33444” to enter to win a FREE Copy of Jay Samit’s book Disrupt You! The winner will be announced during Episode 090. In Episode 90 we talk about how a single African tribe has completely dominated the world of running…and why it matters to you…it is fascinating. Don’t miss it! Question: What obstacles do you see that could be huge opportunities?You can leave a comment by clicking here. When you think of a leader, what do you think of? Do you think of Bill Gates secluding himself in a cabin for a week to think big things. A solitary leader who single-handedly uses his genius to solve every problem, launch every new initiative, and change the world? Well, in today’s episode we’re going to hang up your superman cape and share the 3 reasons that you can’t lead alone. Everywhere we look there are leaders being held up as single-handedly taking on the world and fearlessly leading their companies to record profits and accolades. Donald Trump, Mark Cuban, Jack Welch, Jeff Bezos, Warren Buffet, Bill Gates. Society tries to tell us that these leaders lead fearlessly and lead alone. But the truth is actually very different. On Episode 89 we have an interview with Jay Samit about his book, Disrupt You! : Master Personal Transformation, Seize Opportunity, and Thrive in the Era of Endless Innovation. This was one of my favorite interviews, don’t miss it! Question: Why do you think it is important to get input from everyone on the team? You can leave a comment by clicking here. Have you ever had a great idea? I mean a really really great idea? Did you turn it into reality? The odds are that the idea is still just that…an idea. In today’s episode we are going to talk about how to Get your Ideas Out of Your head and Into the World. Today’s guest has a Ph.D in neuroscience from Stanford University Medical School, is Professor of the Practice in the Department of Management Science and Engineering at Stanford School of Engineering, and executive director of the Stanford Technology Ventures Program. She is the internationally bestselling author of What I Wish I Knew When I Was 20, and the new book, Insight Out: Get Ideas Out of Your head and Into the World. The “Inventional Cycle” – what is it? and why is it important? The importance of being entrepreneurial. How to foster creativity and invention. What happens to imagination as we get older? In Episode 88 we talk about the idea of being a solitary leader and share the 3 Reasons You Can’t Lead Alone. Don’t miss this episode. Question: What is one thing you will do this week to spark your creativity? You can leave a comment by clicking here. We all have had a critic in our lives at one point or another. You know, the type of person that when you leave their presence, your energy is depleted, your joy stripped, and your dreams crushed. What is the definition of a critic (and who is not a critic)? The one tactic to silence your critics forever. Does "loving your enemies" mean you have to put up with critics in your life? Critics only have power over us if we let them. What if your critic is a family member? We also announce the winner of the free copy of Margaret Neale and Thomas Lys' book, Getting (More Of) What You Want from Episode 85. On Episode 87 we have an interview with Tina Seelig, the author of the new book Insight Out: Get Ideas Out of Your Head and Into the World. We talk about how to harness your potential and turn your ideas into reality. Tina does a couple exercises with me that demonstrate how much creativity we all have inside of us. Don’t miss this episode! Question: What can you do to remove your critics from your life today?You can leave a comment by clicking here. How often do you negotiate each day? Odds are, you are negotiating all day long. Whether it’s negotiating your salary, a large purchase, a decision at work, where to go to lunch or convincing your child to do their chores. We negotiate all day long. Today’s guests will help you get the most of the negotiations you find yourself in. Margaret Neale is an Adams Distinguished Professor of Management at the Graduate School of Business at Stanford University, where her research focuses primarily on negotiating and team performance. She is the author of over 70 articles on the topics of bargaining and negotiating and is the coauthor of three books. Thomas Lys is the Eric L. Kohler Chair in Accounting at the Kellogg School of Management at Northwestern University. He was an editor of the Journal of Accounting and Economics for eleven years and has served as a consultant for General Electric and IBM, among other companies. Together Margaret and Thomas wrote the new book, Getting (More Of) What You Want: How the Secrets of Economics and Psychology Can Help You Negotiate Anything, in Business and in Life. Should you make the first offer? What is the role of emotions in negotiation? Margaret and Thomas explain how everyone is negotiating every day. This interview can benefit you whether you’re negotiating a car purchase or getting your child to do their chores. Enjoy my interview with Margaret Neale and Thomas Lys. I am giving away 1 free copy of Margaret and Thomas’ book, Getting (More Of) What You Want to one listener. All entries must be in by Midnight PST on August 16, 2015. The winner will be announced during Episode 086 on August 18, 2015. In Episode 86 we talk about how to silence your critics forever. We will give you several tips on how to make sure your dreams are not crushed by the critics in your life. Also, we will announce the winner of the free copy of Getting (More Of) What You Want. Question: What is your biggest struggle with negotiating? Or, if you consider yourself skilled at it, what is your best negotiating tip? You can leave a comment by clicking here. Episode 084: Are Great Leaders Born or Made? What makes a leader? Is it circumstances? Genetics? Some people choose not to be a leader because they believe that leadership is “luck of the draw”--that some people are just born leaders. In today’s episode we are going to debunk this myth and explain how YOU can become a great leader. We’ve all either had, or seen that person who just seems to be a natural leader…they are charismatic, they’re problem solvers, they’re good public speakers. So the question is, are great leaders born or made? This is the question that we answer in this episode. What great leaders and parents do. On Episode 85 we have an interview with two college professors that have written a book that is all about getting what you want through negotiations in business and life. One thing that our guests note is that we are all negotiating every day. Don’t miss this episode! Question: What choices can you make today to be a great leader? You can leave a comment by clicking here. Enjoy this interview with my friend, Dr. Dale Archer. In Episode 84 we are going to ask a question that is frequently asked in business and leadership circles….Are great leaders made? Or born? The answer may surprise you. Question: What is something in YOUR life that could be considered a “disability” but is actually an advantage? You can leave a comment by clicking here. If you look back at the most successful people in history, You will find that each of them clearly learned to do four things. Some learned them earlier than others. But eventually they learned them all before they reached the level of very successful. 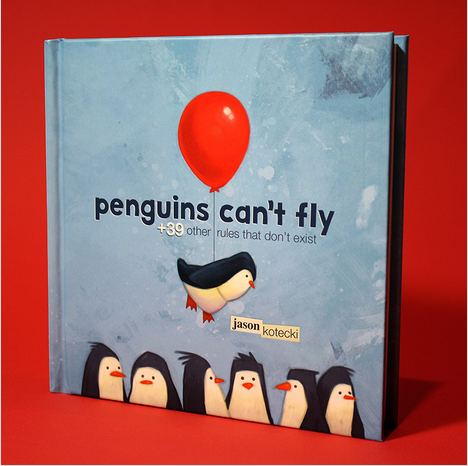 CONTEST: Learn more about how to win a copy of Jason Kotecki’s book, Penguins Can’t Fly and a $25 Gift Card. In Episode 083 we have another fantastic interview to share with you. Matt interviews Dr. Dale Archer and they talk about how having ADHD can be an advantage, not a disorder. They also discuss his book, The ADHD Advantage. Don’t miss this episode! Question: What is the one thing you will do this week to make the leap to very successful? You can leave a comment by clicking here. What do Gandhi, Mother Teresa, MLK, Walt Disney, George Washington, Jesus and Steve Jobs have in common? They were nonconformists. They colored outside the lines. They changed the world. Today’s episode is an interview that will make you laugh, dream and color outside the lines! Today’s guest is an artist, author, speaker, husband, father, and self-proclaimed cereal aficionado. He has made it his mission in life to annihilate Adultitis by uncovering the secrets of childhood and sharing them with others. Ladies and Gentlemen, here is Matt’s interview with Jason Kotecki. How do we escape it? The winner will be announced on the Aug 4th episode and will win a copy of Jason’s book, Penguins Can’t Fly as well as a $25 Gift Card. Join me for episode 82, we are going to talk about 4 “Musts” that will take you from successful to VERY successful. You don’t want to miss it! Question: Share your favorite ‘non-rule’ for a chance to win a copy of ‘Penguins Can’t Fly’ and a $25 Gift Card You can leave a comment by clicking here. Every great leader must learn to do this one thing. In today’s episode we’re going to break down this habit and teach you how to implement into your leadership. In today's episode we talk about this exact topic...delegation. Delegation is one thing that every great leader does. Delegation will give you more Freedom and Trust. Action item: Pick one task that you are currently doing that you can delegate to a member of your team. In Episode 081 Matt interviews author Jason Kotecki about his book "Penguins Can't Fly" and 39 Other Rules That Don't Exist. They talk about escaping "adult-itis"...you don't want to miss this episode! Question: How would you rate your ability to delegate? How would your team rate it? The title of today’s episode is “The Power of Starting Something Stupid”…yes, I said Stupid. This is something that, I’ll admit, I’ve probably had more experience doing than almost anyone. But that isn’t necessarily a bad thing…in fact, it’s something that the highest achievers in all industries do on a regular basis. Today’s guest is a social entrepreneur, the CEO and Founder of Global Consulting Circle, an international speaker and consultant for the corporate growth and personal development industries, the bestselling author of The Power of Starting Something Stupid, has shared the stage with the likes of Stephen R. Covey, Stephen M.R. Covey and Kevin Rollins, and in 2010 was recognized as one of the Top Forty Under 40 “best and brightest young businessmen” in Hawaii. But his life hasn’t been all accomplishments and accolades. He has experienced indescribable pain and anguish, first from the sudden passing of his brother-in-law and only a short time later the death of his infant son. But he would be the first to tell you that these sobering experiences, while unwanted, have made him the man he is today. It is these experiences that have given him the drive to act on his stupid ideas and made him determined to not regret a single day in his life. He is an author, speaker, consultant, coach, entrepreneur, husband and father. You are going to LOVE this interview with my friend, Richie Norton. Join me for episode 80, the first episode of the all-new World Changer Show. My new co-host, Mark Sieverkropp and I will be talking about the one thing that every leader eventually needs to learn to do well. This is something that took me a long time to learn myself and is perfect for the first episode in this new format. Question: What is your “stupid” thing you’ve been putting off doing? What crazy idea have you not yet acted upon? You can leave a comment by clicking here. How’s your energy level right now? Do you need a boost? There are two types of people in the world…those who need an energy boost right now and those that will need an energy boost at sometime in the future. Today, I am going to share with you 5 Caffeine-Free Ways to Boost Your Energy and be more productive. I’m going to go out on a limb and guess that at some point in your life, you have had a lack of energy…Let’s face it…Changing the world can be exhausting. Between work, family, entertainment and activities and everything else that you are doing every day, there is bound to be times when you feel like you don’t have the energy to get through the next 10 minutes…let alone the rest of the day! Of course there are way more than 5 ways to boost your energy…I want to hear what works for you. Leave a comment below with your go to energy-boosting habit, strategy or tip. In today’s episode, I go in depth about my top 5 ways to boost your energy without grabbing that 4th cup of coffee…and it might sound like an exaggeration, but one of these ways literally changed my life! You can listen to the full episode below. Action item: Pick one of these tips and put it into practice. Action item 2: Leave a comment below and share what you do to boost your energy. Join me for episode 79 with someone who is determined to live a life of no regrets. He has known the pain of losing a child and the joy of living life on his own terms. He has written best selling books and shared the stage with some of the foremost leadership experts of the past few decades. He’s created a business that helps people lean into their fears, make a difference and live without regrets. Don’t miss this interview! I will have an exciting announcement to share with you in Episode 80! It’s something that I’ve been working on for a few months now and it’s going play a big part in taking the World Changer Show to the next level! You DON’T want to miss it! Question: What do you do when you need to boost your energy? You can leave a comment by clicking here. At any point in time, we’re either going through a transition, we just came out of one, or we’re about to go through one. How do we handle the difficult transitions in life? Today’s guest will show you how. The title of the episode is “How to Navigate Life’s Difficult Transitions” and the title says it all. It’s one that truly applies to everyone. My belief is that all of us are either in a transition, just came out of a transition, or about to enter one. Brian Holmes, the Founder and President of the Strategic Living Institute (SLI), a life changing organization dedicated to teaching people to harness the power and potential that God has given them. SLI’s mission and method is revolutionary, providing individuals the opportunity and means to receive inner life healing, purpose specific training and development, and the practical activation necessary to be mobilized as leaders of cultural transformation. Each year, Brian travels extensively, speaking in conferences and leadership forums around the world. He has authored numerous books and curriculums, including the internationally acclaimed, ‘The Ties That Bind’, a study on identifying and breaking unhealthy connections and soul ties. In addition to his books, Brian has also created numerous video and audio programs which are specifically targeted to unlocking and releasing the full potential of every individual. Brian is a board certified counselor; a certified facilitator for The Pacific Institute; an author and lecturer; a Certified Life, Business, and Leadership Coach; a Master Coach Trainer; and mentor to people in all fields. Join me for episode 78, 5 Ways to Boost Your Energy. When it’s the middle of the afternoon and you need a boost, what do you do? You could reach for the coffee, but caffeine loses its effect after a while. Not to mention it’s only a temporary lift. You need lasting energy. So what do you do? In episode 78, I’ll share five ways to boost your energy at the office or at home. Number three literally changed my life. Question: What transition have you gone through that put you in a better place in life? What did you learn from it? You can leave a comment byclicking here. Aren’t great leaders supposed to know it all? That was the lie I told myself for nearly a decade. Today’s guest destroyed that belief once and for all. In this episode of the World Changer Show, he’ll share why great leaders must be ignorant (or at least act like it). It’s not very often that I read a book and recommend it as highly as I recommend the one we’re talking about today. I was honored to join the author in a wonderful conversation about leadership, why ignorance is a necessary leadership trait, and what we can learn from world-class composers and conductors. -Why you shouldn’t be a know-it-all leader. -How ignorance is central to great leadership. -What you can learn about leadership from six world class conductors, all with very different styles. -What it was like to be mentored by the great Leonard Bernstein. -How “experts’ syndrome” can hold you back and how to overcome it. -Why you must embrace the gaps in life (and how to do it). -What makes some music timeless and others forgettable. -How allowing individuals to express their uniqueness actually makes for better teamwork. Our guest today is a protégé of the great conductor Leonard Bernstein and has conducted orchestras around the world. He is also the author of the amazing new book, The Ignorant Maestro, which has quickly become one of my favorite leadership books. Make sure to check out his popular TED Talk below in the resources section. To date, it has more than 3 million views. He is an orchestral conductor turned into ‘conductor of people’ – be it in in government, academia, business, education, therapy – anywhere the creation of human harmony through cooperation is desired. He teaches leadership to Fortune 500 companies, nonprofits and universities, and at conferences around the world, including TED, Google’s Zeitgeist, and the World Economic Forum at Davos. And, to top it all off, he is one of the most enjoyable, humble, and nicest people I’ve had the privilege of interacting with on this podcast. Please welcome to the World Changer Show, Itay Talgam. Join me for episode 77 with Brian Holmes. The title of the episode is “Now to Navigate Life’s Difficult Transitions” and let’s just say that you don’t want to miss this episode. My belief is that all of us are either in a transition, just came out of a transition, or about to enter one, so this truly does apply to all of us. Question: How can you embrace ignorance more to better lead those who follow you? You can leave a comment by clicking here. There are certain things that no successful person ever says. Successful people are intentional about the words they speak, to themselves and to others. Today, I’m going to share 29 things successful people never say. Some of these 29 things might seem obvious. Others some might surprise you, especially if you’ve based your definition of success on what Hollywood or the media says. It is by no means a complete list, so I want to hear from you. Leave a comment below with what you would add. You can also tweet it using the hashtag #SuccessNeverSays. In today’s episode, I go into detail about each of these, why successful people never say these things and how simply saying these can harm you and keep you from success. You can listen to the full episode below the list. I never failed along the way. I never thought about quitting. I never lost any sleep. It’s too late to start. There’s plenty of time to start. Everyone thought it was a good idea. I’ve kept all the same friends. I never celebrate the little milestones. I listen to my doubters. This is what my parents wanted for me. I never learned to delegate. I let things like email, social media, and phone calls distract me. I speak exactly what is on my mind. I said no to everyone. Action item: Think of things that you say to yourself and others that you need to stop saying. Then stop saying them. Action item 2: Tweet about that or something else successful people never say. Include the hashtag #SuccessNeverSays. Below are some images you can post on Twitter, Facebook, and Pinterest. Join me for episode 76 with someone I am so excited to introduce you to, although you may know him already. He is a protégé of the great conductor Leonard Bernstein and has conducted orchestras around the world. He is also the author of the amazing new book, The Ignorant Maestro, which has quickly become one of my favorite leadership books. If you want a preview of this interview, check out his popular TED Talk above in the resources section. Todate, it has more than 3 million views. Question: What would you add to this list? What else do successful people never say? You can leave a comment by clicking here. You have something to say to the world. You have a contribution to make. Each of us has ideas that can reshape the world, in large ways or small. That is how Dorie Clark opens her new book, Stand Out: How to Find Your Breakthrough Idea and Build a Following Around It. Whatever your issue, if you really want to make an impact, it’s important for your voice to be heard. I could not agree more. You do have a voice and it should be heard. But the question ishow? Well, Dorie will show you how. I’ve been in the marketing space for more than a decade. I read the book because I thought it would help the people I talk to…aspiring bloggers, business owners, and thought leaders. I honestly didn’t expect anything for ME! And yet it’s one of the most highlighted books I own. Everyone can learn WHY they should stand out, HOW to do it and ultimately WHO can benefit. This book is a MUST READ for anyone looking to share their ideas, message, and talents with the world. In today’s episode, we go in-depth into many of ideas and principles in the book, starting with why you should find your breakthrough and build a following around it – why you should stand out! Why so many of us shrink back when it comes to sharing our ideas and voice. What has helped Dorie overcome her fears. How to stand out (without getting arrested or being born famous). The questions you need to ask yourself to discover your breakthrough idea or message. How to be seen as an authority in your industry. The always popular much, much more. Dorie Clark is a marketing strategy consultant, professional speaker, and frequent contributor to the Harvard Business Review, Forbes, Entrepreneur, and the World Economic Forum blog. Recognized as a “branding expert” by the Associated Press,Fortune, and Inc. magazine, she is also the author of Reinventing You: Define Your Brand, Imagine Your Future, another fantastic book that I highly recommend. Clark consults and speaks for a diverse range of clients, including Google, the World Bank, Microsoft, Morgan Stanley, the Ford Foundation, the Bill & Melinda Gates Foundation, Yale University, the Mount Sinai Medical Center, and the National Park Service. We were born less than a year apart in the same hospital, which her father and my mother both worked in at the same time. Small world, huh? For more about Dorie, check out her About Page. Does your family have a negative history? What about your job? Is there something that it seems you inherited or as “always been that way?” If so, you are the one to break the cycle. In today’s podcast episode, I’ll show you how. That’s right. I declared that you are a cycle breaker. You can break the negative cycles of your father, your mother, your grandparents, your predecessor at work, or your team’s performance. You are capable of putting an end to anything you put your mind to. That means though that you have to take responsibility for doing so. You can’t blame your parents or family history. You can’t blame the team leader before you or your boss. You can’t blame God. If you aren’t the one to break a cycle, it may never be broken. It will come back to haunt future generations. And it will be your fault. If you want to learn how to break the negative cycles in your family, your business, and your community, today’s episode is for you. Join me for episode 70 with Dorie Clark, author of the brand new bestseller, Stand Out. This is an amazing book and even better interview. If you’ve ever wondered how YOU can find your breakthrough idea and actually build a following (and business) around it, this episode is for you. This is one that no platform builder or world changer should miss. Question: Have you broken a cycle? If so, how did you do it? You can leave a comment by clicking here. Have you ever been rejected? That’s like asking if you’ve ever drank water. Rejection is a part of the human experience. But…have you ever purposefully been rejected…over and over again? Today’s guest has. At the risk of giving away too much of his story, today’s guest, Jia Jiang, went on a rejection journey. After facing a crippling rejection, he started rejection therapy by purposefully seeking out opportunities to be rejected. After his journey, he had a breakthrough. He realized that rejection isn’t something you should shy away from, but something that you can use to your advantage. He will share with you why rejection is so hard to handle, what you can learn from rejection, how to use it to your advantage, and how to make a proper paper airplane (using a $100 bill at a bank). Join me for episode 69, How to be a Cycle Breaker. In this episode, I will show you how you can break the cycles that have bound you to mediocrity or defeat. Does your family have a negative history? What about your job? Is there something that it seems you inherited or as “always been that way?” If so, you are the one to break the cycle. Question: How have you used rejection to your advantage? You can leave a comment by clicking here. You cannot measure influence with numbers. When I first started my blog, I spent a lot of time caring about things like subscribers, followers, and number of this or that. The problem with that is that none of those measured my true influence in the lives of others. If you’ve ever fallen in the trap of trying to measure your influence, this episode is for you. So many of my listeners get caught up, like we all do, in statistics. We want to know our Klout score, how many downloads we got, or how many followers we have. But the voice that says those numbers matter is a lie. When I first started, I measured every single day obsessively. One day I would get ten sign-ups, the next day none. Then I’d wonder, what did I do wrong to get zero subscribers? The answer is nothing. That’s just what happens day-to-day. Over time, I realized that I shouldn’t be focused on those numbers. I should be focused on my followers, not my follower count. I should be focused on you. Your post today was life-changing. I finally found the courage to have a difficult conversation. I will be a better father today. I’ve been putting off asking for a raise…that stops today! Thank you for inspiring me to start my own business. Words like those are immeasurable. How can you possibly put a value on life-changing? How do you quantify courage? Better fathers and new businesses don’t make for pretty spreadsheets. One changed life, one more courageous leader, one better dad, one inspired entrepreneur…that is influence, not numbers. Today’s episode busts the lie that tells you that statistics, not people, matter most. Join me for episode 68 with Jia Jiang. a man with an amazing and inspiring story of overcoming rejection…on purpose for 100 days. It’s wild story that will show you how to get past your biggest fears and overcome rejection. Question: How are you influencing others? You can leave a comment byclicking here. Today's guest is helping in the fight against one of the greatest epidemics of our time: fatherlessness. If you don't think it's an epidemic, consider the sobering statistics below. The US Department of Health/Census reports that 63% of youth suicides are from fatherless homes. 90% of all homeless and runaway children are from fatherless homes, as reported by The US D.H.H.S. and Bureau of the Census. 85% of all children who show behavior disorders come from fatherless homes (Center for Disease Control). 85% of all youths in prison come from fatherless homes (Fulton Co. Georgia, Texas Dept. of Correction). This is clearly an epidemic. It might be the single biggest problem facing our nation and the world. The reality is that children need fathers. While we appreciate, honor, and offer as much help as possible to single mothers like my mom, the statistics don't lie. A nation and a world without fathers is faltering. Today's guest doesn't claim to have all the answers, but he is on a mission to address the problem. He hosts a call-in, text-in and email-in podcast for fatherless children get their life questions answered, in an effort to thwart the ill effects of living without fatherly advice. Please join me in welcoming to the show, Dr. Shane Wall. Dr. Shane Wall is host of the Hi Dad Show, a call-in, text-in and email-in podcast for fatherless children get their life questions answered, in an effort to thwart the ill effects of living without fatherly advice. He is the founder and pastor of The Feast of the Lord in Orangeburg, SC, where he and his wife Jasmyne reside. Pastor Wall is the author of the book, What Are You Doing After the Dance? and his newest book, Understanding. Join me for episode 67, The Lie of Influence. If you've ever fallen in the trap of trying to measure your influence, this episode is for you. So many of my listeners get caught up, like we all do, in statistics. We want to know our Klout score, how many downloads we got, or how many followers we have. But the voice that says those numbers matter is a lie. Come back for episode 67 to learn why. Do yourself a favor…the next time you start to say something bad about yourself, SHUT UP! Seriously, shut up. Don’t say it. You can think it, but don’t say it. Don’t mumble it under your breathe. Don’t say it to someone else. Don’t write it down. Your negative thoughts don’t have to become reality. In fact they can’t be, because you are too valuable to the rest of us to live that way. The same applies to talking to and about yourself. I’m not telling you to live in fantasy land. The world will keep you from ever doing that. It will knock you down, drag you around, tell you lies, and leave you the cleaning bill. I am telling you to control what only you can…your words about yourself. In today’s episode, I will share six strategies to help you overcome the negative words you say about yourself. This might be one of the most important episodes I ever do, because I see this problem in so many people, from friends, family, and coaching clients. If you want to be successful, you have to change the way you talk about yourself. This episode will show you how. Join me for episode 66 with Dr. Shane Wall, who is playing a large role in addressing the problem of fatherlessness in this country. He hosts a call-in, text-in and email-in podcast for fatherless children get their life questions answered, in an effort to thwart the ill effects of living without fatherly advice. This is a powerful episode that you don’t want to miss. Question: What do you need to stop telling yourself? What positive words can you replace it with? You can leave a comment by clicking here. At an early age (four years old), today’s guest decided to become a millionaire. Twenty-one years later, he achieved it. That might sound like the end of the story, but it’s actually the beginning. Deciding at the age of four to become a millionaire is not very common. Usually four-year olds want to become a firefighter, an astronaut, or perhaps an athlete or doctor. But JV Crum III was an entrepreneur at heart, starting his first business at five years old, and made a decision early in life that he wanted to become a millionaire. When he achieved that dream at the age of twenty-five, he discovered it wasn’t all it was cracked up to be. He was basically living the American Dream but he writes, “I thought that becoming a millionaire would be the whole answer, but I wasn’t happy nor was I fulfilled.” We discuss how he came to that realization and what it was like to realize that he hit his goal, had all the stuff he dreamed about and discover he wasn’t truly happy. I also ask JV if he thinks entrepreneurs are born, made, or if that path in life is something you have to decide on. His answer might surprise you. We also discuss the power of visualization, specifically how he coaches someone through his conscious process. And since JV has spent decades studying ultra-successful people, I ask him about some of the common traits among them. This is an interview that you don’t want to miss. Our guest today is a best selling author, world-renowned business coach, and mentor. He became a self-made entrepreneur millionaire in his twenties and is an investor who has built and sold companies. Our guest is a visionary strategist and is also a speaker in the areas of conscious business, fast profit growth, and youth leadership. He holds graduate degrees in three areas – law, and MBA, and a Masters in Psychology. He is the Founder and Director of a global non-profit that supports the development of youth leaders from age 6 to 25 who are giving back to their communities and uplifting humanity. The non-profit he founded, Conscious World Foundation, produces the annual Conscious World Day to both honor youth from around the world and inspire others with their heart-felt stories of giving back and making their difference. On a personal level he is an adventurer and world-traveler who loves the outdoors, nature, and all things related to water, from class-five water rafting to skiing. He’s helping people to live with consciousness and purpose. He’s showing the world that wealth and social responsibility are not mutually exclusive. And he’s inspiring a new generation to think big and think bold. JV is a true world changer. Join me for episode 65, How to Overcome Negative Self-Talk. I’ll share with you six strategies to help you overcome the negative words you say about yourself. Question: What successes have you had in life that didn’t fully satisfy you? How did you react? You can leave a comment by clicking here. Have you ever been told to “keep both eyes on the ball”? A friend of mine said that very thing a while back. His business is struggling and he is battling the constant fight to maintain balance between the future (vision) and the present (day-to-day responsibilities). He, and his business it seemed, was at the end of their ropes. According the Small Business Administration, almost 90% of all businesses in America fail. My friend was about to become a statistic. In today’s episode I share with you what I shared with him. While it’s geared towards the struggling entrepreneur, it applies to everyone, whether your business is struggling, wildly successful, or you have no business at all. Join me for episode 64 with JV Crum III, author of The Conscious Millionaire. He’ll share his journey of deciding to become a millionaire at a very young age, achieving that exact goal, and then realizing there was more to life than that. He’s helping people to live with consciousness and purpose. He’s showing the world that wealth and social responsibility are not mutually exclusive. He’s inspiring a new generation to think big and think bold. And his interview is awesome. Question: Have you ever allowed the day-to-day work to get in the way of your big dreams? You can leave a comment by clicking here. Darin Sargent was born with a gift. It might not look like a gift to you and me, but Darin thinks it is. "I have been born with a unique gift of having only one hand and it has helped me see life from a different perspective than most. I believe what you read on my blog and in my books will reveal that to you and in some way help you with the challenges that life seems to often bring our way." I don’t know what Darin would be doing today if he had two hands. But I do know this…that when he walks into a room full of antsy teenagers to tell them that they can overcome obstacles, two-handed Darin doesn’t stand a chance. One-handed Darin, on the other hand, commands immediate attention. He could have focused on all the things he can’t do with only one hand. Instead he turned that missing hand into a conversation starter. If you want to be inspired and learn how to overcome any obstacle, this episode is for you. I am the author of The HandBook: Five Forces To Form Your Future (Insignia Books), a brand new book on 5 key principles that will transform your destiny and help you make the impact you were placed on this planet to make. I also wrote Thank You Mr. Jenkins (Adsum Press) which is the true heart-warming story of a teacher who decided to make a difference in the life of one child that was born differently. It will inspire you to embrace your uniqueness and understand that it is a blessing and not a curse. In 2008 I started a Motivational Business called Let Me Give You A Hand and I have been fortunate enough to speak to thousands of young people and adults across the nation. My message of overcoming and embracing who we are while facing the many challenges that come against us, has resonated with audiences worldwide. Being born the way I have allows me to relate to those struggling with their identity, helping them create an attitude of success in their life. I am all about helping young people and adults overcome! I also pastor a great church in the San Diego, California area and am blessed to be leading a pretty incredible group of people. In 1993 I married the love of my life and we have 3 amazing kids that still think having a dad with one arm is kind of cool! FREE WORKSHEET: How to Turn Your Worst Disadvantages into Your Greatest Assets – This process isn’t easy. That’s why I created a FREE step-by-step guide to show you how to systematically turn your worst disadvantages into your biggest assets. Join me for episode 63, What to do when your business is at the end of its rope. According the Small Business Administration, almost 90% of all businesses in America fail. Does that feel like it might be you? I’ll share hope, inspiration, and a critical mindset shift you have to make today. Question: What obstacle have you allowed to hold you back? How will you overcome that? You can leave a comment by clicking here. What do you really want to be? What do you really want to do? What do you really want to have? And you sell yourself short. You aim for mediocrity…and that is exactly what you get. But there is always a gnawing deep in your soul to be more, to do more, to have more. Today you’ll learn a technique that will make it possible to experience more. FREE WORKSHEET: Do you even know what your true dreams are? This free worksheet will help you discover them. FREE WORKSHEET: Learn how to set positive expectations with this free worksheet. BOOK: Influence by Robert Cialdini. Join me for episode 62, with one of my favorite people in the world Darin Sargent. Here’s what I want you to do. Google his name. His story is unbelievably inspiring. He is helping people across the world to overcome their obstacles and…well just WOW. You are going to LOVE this interview. Question: How can you act as if with one of your dreams? You can leave a comment by clicking here. What were you doing when you were nine years old? Personally, at the age of nine I was busy learning this new entertainment system called Nintendo and starting my own spy agency. Today’s guest, however, was starting a worldwide movement. Four years later, she is thirteen years old and leaving her mark on the world. Elayna Hasty has such a remarkable story already. Here’s a little bit about her and her movement. Listen below for more of her story and how she started this movement at such a young age. Elayna is recognized as an anti-bullying advocate and openly shares her experiences through public speaking as part of her Girls Against Bullying Girls Workshops. G.A.B. Girls is a not for profit organization that promotes leadership, self-esteem, community involvement and communication skills to children of all ages. The goal between the girls is to unite against bullying. At the age of nine, Elayna decided that she wanted to make a difference. Elayna was bullied going into her new school. She also witnessed a fifth grade boy taking away a lunch bag and teasing a kindergartener. Elayna knew it was not right. Elayna even had a friend who resulted in being homeschooled due to bullying. For Elayna, her friend’s incident hit close to home. At that moment, Elayna knew it was time to make a change. Elayna has put in more than 1,000 hours of community service since 2010. She has participated in Kids Against Hunger, Williams County Animal Shelter, Williams County Cancer Association and Queens For A Cause. Elayna has been recognized by several organizations; Over My Shoulder Foundation, Super Girl Radio, Kids Are Heroes and Yes FM Christian Radio. She is also a member of One Girl, One Voice, Core and attends her church youth group weekly . Elayna has received a Proclamation for her community Service from her hometown of Montpelier, Ohio, the True Beauty Award, Kids Are Heroes Award, National American Miss Preteen Volunteer Service Award (for Ohio), was a 2010 Recipient of the Cheryl Harter People’s Choice Award, and received a proclamation from her hometown for Bullies Free Week. She was also spotlighted in BYOU magazine for her work. Elayna enjoys competitive cheerleading, volleyball, Campus Life and spending time with her friends. Elayna works vigorously in trying to reach out to students across the country. She encourages them and shares her motto; “Encourage, Lead, and Empower.” Elayna receives and personally answers letters to each girl and mom asking for bullying support. She helps in empowering students nationwide to be comfortable and proud of their own true beauty. Elementary workshops cater to younger girls by encouraging self-esteem, leadership, and compassion for others. The girl’s role play and break into small group discussions regarding bullying. They also help younger girls discuss what makes them special. Advanced workshops are designed for middle school girls to open up about the mean girl syndrome, trying to fit in, and finding the courage to go out into the community to make their own positive mark. One of Elayna’s favorite sayings has to do with words of wisdom given to her by her mother and the late Mother Teresa. Life is painful sometimes. My aunt Mary recently passed away from a two-year battle with cancer. Her last days were unimaginably painful. While we miss her tremendously, we all breathed a sigh of relief for her sake when she was taken home. Have you ever wondered if finding your calling was something for everyone or just for those who were really special? When you read stories of people who have “made it” you assume they must have just known. They must have had clarity. But that’s not true. That’s what today’s episode is all about. That’s the subject of the latest book by best-selling author, Jeff Goins. Jeff is someone who, in a short amount of time, quit his job working for a nonprofit, launched an online business, and began living his dream. And now, in his book The Art of Work, he wants to help you do the same. The book is full of inspiring anecdotes from people who are doing meaningful work and living out their life’s purpose every day. They have found their calling. And Jeff argues this is not something reserved for the social elite. We all can discover what we were born to do and start doing it today. Listen to Jeff’s interview and get a preview of his new book, which you can get for free for a limited time (just pay shipping). Learn how to find your calling, discover what you were meant to do, and pursue your passions. Question: Are you living out your calling right now? Why or why not?You can leave a comment by clicking here. So you’ve been knocked down. Now what? How do you bounce back from defeat? That’s what today’s episode is all about. The reality of life is that you will suffer defeat. There will be times when you choke, succumb to pressure, or just lose it in the furnace that is a stressful and important situation. Golfweek writer Jeff Rude wrote an incredible article recently entitled, Takes special player to bounce back from major flub. The article reads not so much as a lesson for golfers, but for everyone. Business owners, parents, students, salespeople, you name it. Get in that position again. I go in-depth on each of those steps in today’s episode. Question: How do you respond to defeat? What tips do you have for someone who feels defeated? You can leave a comment by clicking here. I'm so excited to bring back today's guest for part two of his interview on redefining rich. Part one was so good and we received a ton of awesome feedback...but part two is even better. Matt Ham's story starts with what he calls a "good life crisis." Not a mid-life crisis, but a crisis rooted in settling for the American Dream as he knew it. That led him on a quest to redefine rich using his four principles, which make up an acronym for the word RICH. H - Humble yourself with confidence. In part one, we covered the R and part of the I. Today, we'll wrap up with the rest of I, C, and H.
If you haven't listened yet, make sure to go back and listen to part one in episode 54. After chasing the world’s version of richness in his own life, Matt found himself empty. Regardless of his material well-being or his financial prowess, he felt a longing for more. Truthfully, he lived a life rooted in comparison; He was trapped in what he calls The Good-Life Crisis. Life was good, but then again, it wasn’t. A successful small-business owner ranking in the top 1% of all agents in his industry, Matt’s proudest title is that of husband and dad. Matt and his wife, Liz, have three sons under the age of three, of whom the younger two are identical twins. An avid triathlete, Matt trains and competes in races of various distances throughout the year, including the Half Ironman. Matt and his family make their home in Wilmington, North Carolina. Where have all the mentors gone? Today we’re going to discuss the miracle of mentoring and how to find the right mentor for you. I recently had lunch with a friend and the topic of mentoring came up. My friend is short on time. His schedule is crammed already and he feels like he hardly has time to breathe. So what advice did I give him? Yes, that is right. I suggested he spend an additional two hours each week mentoring someone. Mentoring has become a lost art. I think it is due, in part, to availability of information at our fingertips 24/7. Who needs a mentor when we have Google, right? But Google won’t ask the tough questions that you need to be asked in life. Google won’t ask you what God looks like or why you really hired that person or what’s keeping you awake at night. It won’t make you think deeply and rarely will it give you an unexpected nugget of truth that changes your life. That’s not its job. Years ago, when large, now-fossilized animals roamed the earth (you know, the 1950’s), mentoring was still commonplace. It was necessary. Mentoring is how teenagers and twenty-somethings learned their jobs. It’s how they learned to be husbands and fathers, wives and daughters. It’s how humanity passed knowledge from one generation to the next. It’s how painful life experiences became valuable life lessons for those willing to listen. And we’ve lost that. But you can help change that. In today's episode of the World Changer Show, I’ll share with you about the miracle of networking and how to find the right one for you. What does it mean to truly be rich? That's the question today's guest is answering every day. He is literally redefining rich through his book, his podcast, and his online platform. That led him on a quest to redefine rich, with his four principles, an acronym for the word RICH. Those might not make much sense until you listen, but when you do, you'll be blown away by Matt's world-changing message. It was so good, that we went for more than an hour, so I broke the episode into two parts. Part one airs today and part two will air next Friday, so come back for that! After chasing the world’s version of richness in his own life, Matt found himself empty. Regardless of his material well-being or his financial prowess, he felt a longing for more. Truthfully, he lived a life rooted in comparison; I was trapped in what I call, The Good-Life Crisis. “Your best is yet to come.” You’ve certainly heard that before. Perhaps, like me, you’ve rolled your eyes at it when a well-meaning parent or friend said it. Have you ever said things like that to yourself? You hold yourself back when you say things like that. Typically for one of three reasons. Today, I'll share those three reasons with you and how to avoid the trap of making the past the best of your life. Your best really is yet to come. Listen to today's episode to found out how. According to statistics, most of us don't like our jobs. That's a big problem. When we're not doing work we love, we're unable to fulfill our true purpose, our happiness is sapped, and our relationships are often destroyed. Today's guest can help with that. His purpose is simple: to help people find work they love. He helps others find the career that they were meant for. I believe that this is important work. Just three decades ago, almost two-thirds of Americans liked their jobs. The divorce rate was lower, the overall happiness of the population was higher, our productivity (in the US) was the best in the world . Today, that is no longer the case. Have you found work that you truly love? Are you excited about it every day or at least most days? If not, today's episode is for you. Join me and Scott Barlow as we show you how to find work that you love. Scott Anthony Barlow is the Founder of Happen to Your Career, a company that helps you stop doing work that doesn’t fit, figuring out what does and then teaching you to make it happen! He has been helping people develop their careers and businesses for over 10 years as a Human Resources Leader, Business Development Expert, and Career Coach. With over 2000 interviews experience from his HR career, Scott interviews others telling their story of finding work they love on the Happen to Your Career Podcast . Scott and his wife Alyssa have 3 children and live in Moses Lake, Washington. The business I was a part of at the time went through all four phases. I’ll share our experience and give you a closeup view, an autopsy of our failed business. What if you could create products that connected to your purpose? That's exactly what today's guest is all about. What's it like to be so stressed out from work that it causes physical problems? Many of you can relate. You know that feeling all too well. Today's guest was so stressed that he broke out in rashes, suffered debilitating illnesses, passed out on a bus, and ultimately left his high-paying job to start his own company, based on his life purpose...and yours. Andy is the the founder of PlumDeluxe.com, the website that helps you create moments that matter. Plum Deluxe was founded in 2007 as an online community to foster a national conversation about mindfulness and connection, encouraging individuals to create moments that matter with friends and family - whether that's hosting a dinner party, going to a yoga class, treating themselves to a spa day with a friend, or just optimizing their daily routines to include more self care. He started his company to share the lessons he learned from his mother, who lost her 6 year battle with cancer. According to Andy, those 6 years were the best years of her life - her fitness improved, she spent a lot of time with friends and traveling, and her positivity was off the charts. Andy's hope is to help others be more positive and live a good life without the need for a major life event. His mom taught me that no matter your circumstances, you can choose to create moments that matter, every day. Plum Deluxe exists to help you decide what kinds of moments are important to you – in order for you to live a life you love. How is having a powerful network like being able to skip the lines at the movies? Well, today's guest knows better than most, because that's exactly what he gets to do. In this episode, we have our first return guest, Mark Sieverkropp, and he's here to tell you how you can skip the lines of life, just like at the movies. Plus, we'll talk the upcoming Networking with Purpose LIVE event. There's still time to register, so go to the show notes page at http://www.mattmcwilliams.com/049 to sign-up. Mark and I preview some of the topics of the event and discuss a few of the most asked questions we've received about the event. It’s decision time. On the one hand, hundreds of people have already registered and are ready to change their world with this information. Others hesitate, wondering if this event is really for them. I guess that depends. You feel stressed knowing that you don't have the right connections and contacts if you truly need them. You're looking to launch a new business or career this year but don't have the right relationships to help. You feel like you don't have enough time to network and build the right relationships. You're turned off by the slimy, icky feeling you get at "networking" parties or other events. You see others succeeding because of their networking and say, "That'll never be me." (FALSE! It can be you). You already have a powerful network of intimate relationships that you can call on when you need them most. You're rich beyond belief and don't want to make anymore money. You can't find two hours in your schedule to either attend the event live or watch the replay, no matter how life-changing it may be. You're not ready to devote a small amount of time each week to developing a powerful network. You're afraid or unwilling to get past your fears of relationship-building and learn how to connect with people in new ways. If anything on that first list resonated with you, I invite you to join me, Mark, and John (and 100s of others) for this event. The cost is small in comparison to the impact this event could have on your business, your career, your family, and your future. Have you ever worked in an environment so toxic, you just knew you had to get out? But you couldn’t get out…because you needed the job. I’ve been there. Most people have. But there is something you can do about it. Have you ever said, “I can’t afford to lose this job.” You stayed in a job you hate and it made you absolutely miserable. Maybe that describes you right now. Well, if that is you, I'm here to help. The fact is that when you are stuck in a job you hate, it is almost impossible to fulfill your purpose and do what you've been called to do. So, what do you do when you need a new job and your network is as cold as ice? Well, that's what today's episode is all about. Have you ever seen a need in the world and felt a passion boil up inside of you? You saw a problem and knew something needed to be done. Then a voice said, "What are you going to do about it?" That's exactly what happened to today's guest. And she chose to do something big. Today's guest heard all the same statistics that many of us have heard. She saw the same problems. And she decided to do something with the passion she felt for a major issue in the world. Fifty years ago, there were nearly ten times more trees in the world than there are today. We've lost nearly ten billion trees. So, what can we do about that? How about starting with planting one million? That's what Caroline Nettle is doing. Her tree planting holidays are helping to address a global problem. All because she took action. After many years in the corporate world travelling around the globe, Caroline Nettle embarked on a journey of self discovery and healing. Having achieved this, she has decided that what she would like to do with the remainder of her years is to plant trees where they are needed most. Her project, called Tree Planting Holidays, will be offering holidays to those that want to help her to plant a forest in Botswana. Today we’re going to talk about networking. No, not the kind of networking you might be thinking of. The kind where you all stand around and that one guy, who’s always overdressed comes up and the first thing he does is slides a business card in your hand and starts talking about himself. Not that kind. I'm talking about the kind of networking where you intentionally build relationships with others and who you can benefit…and maybe they might even benefit you someday. I’ll share with you today 10 simple strategies for building a powerful network you can USE (yes its ok to use your network) that you can use when you need it most. Strike that…it’s not who you know, but how well you know them. FACT: Every job I’ve ever had in my life came from my network. I’ve literally never worked for someone who I didn’t know or wasn’t referred to me by someone I know. Not once have I ever landed a job because of an application or résumé site. I tried them and they led nowhere. FACT: Of the 50+ people I’ve hired in my life, exactly one was not a referral from someone else. Everyone I’ve ever hired in my life was the result of a relationship. Except that one guy…and we fired him within a year. FACT: Every client I’ve ever obtained was the result of my network. Going back to my first business more than ten years ago, every client I’ve ever worked with came to me or was introduced to me by someone else. I’ve never advertised my services because I’ve never needed to. How do I maintain a large network that keeps growing every week? How do I keep it warm so that when I need it, it’s there for me? Listen to today's episode for all 10 ways. There are greater problems in the world, you know, but first start with the world you know. That's the mantra of today's guest, who is truly changing not only his world, but the world of others around him. Today's guest is truly an ambassador. He is a networker extraordinaire who will show you what it means to build your own brand, even when you work for someone else. He'll share some ways that he has built a powerful network and how to start changing the world by changing the world you know. He's worked at Intel for almost 10 years as an Operations Manager and Employee Ambassador Strategist. His philosophy is simple: get to know the people and what they want; let them know what you want; see where you can merge the two as often as possible. He is originally from Brooklyn, NY, born to Haitian parents and is a former college athlete (football and track). Outside of Intel, He is a certified life coach and professional speaker at all kind of great institutions of higher learning and conferences like SXSW. He recently created a program called, The New Art of Conference Networking: Hashtags to Handshakes that teaches conference participants and organizers how to transfer online contacts to powerful offline relationships. He’s helping others to create more impact, better connections and create more opportunities for themselves by building their OWN brand. There are greater problems in the world he knows, but first he is starting with the world he knows. It was a miracle that anyone still worked for us. I was a 28-year old executive in a fast-growing company. I was in way over my head. I had a well-deserved reputation as a hothead and a jerk. And the lines of communication between my team and me were beyond cut off. They were non-existent. So, it was indeed a miracle that anymore still worked for us. The only saving grace was that there was another leader in the company who was great. His awesomeness apparently made up for me. Plus, I do suppose I had a few redeeming traits. The good news is that, over time, I learned three valuable lessons. Those are the three lessons I want to share with you today. The three things a leader should never, ever, ever, ever do. Episode 043: Hans Finzel - Are Leaders Born or Made? When I first became a leader (or least when I finally realized I had four other people who reported to me), I knew I needed help. I went to the bookstore one Saturday afternoon and the first book I bought was from today's guest. I remember reading that book, The Top Ten Mistakes Leaders Make, over the next week and along with other books, made me into a much better leader. I'm honored to introduce today's guest, someone who I consider a virtual mentor and someone who recently has become a great friend, Hans Finzel. Hans is the author of eight books, including his bestseller The Top Ten Mistakes Leaders Make, the first book I ever bought on leadership. His books have been translated into over twenty foreign language editions. He is a graduate of Columbia International University(BA), Dallas Seminary(ThM) and Fuller School of Intercultural Studies(DMiss). Afew years ago, I spent time in a recovery group. My goal in the group was to learn more about why I was often so angry and to learn how to avoid it turning into the rage I so often felt. What I learned along the way was surprising, though. I learned ten amazing lessons about living with passion, leading with purpose, and ultimately leaving a legacy of which I could be proud. Through the process of attending the meetings and getting to know the members, I learned the most important lesson of all that I want to share before I share the other ten lessons. When I attending my first meeting, I will admit that I entered with the attitude that myproblems were not as bad as everyone else’s problems. In other words, my poop didn’t stink as badly as the rest of them people there. If I am abundantly clear, I looked down on everyone else there. What I expected and what I indeed saw at first was a group of alcoholics, drug addicts, and weirdos. Not the types of people I would otherwise associate with. What I found after only a few weeks were some of my best closest friends and nicest people I’ve ever known. Hearing about (and sometimes witnessing) their transformation is one of most beautiful things I’ve ever seen. That was the first thing I had to learn, but I learned ten more things that I want to share with you. What if the worst day of your life could actually be something that led to discovering one of your callings? That's what happened to today's guest when he rushed to his son's school only to find his lifeless body lying there. To save others from the same fate. Today I am joined by our first international guest since Farnoosh Brock (who technically lives in the U.S. but was raised in Iran), Niels Kaastrup-Larsen. Niels is a Swiss-based dad, husband, entrepreneur and hedge fund manager turned podcaster. His podcast TopTradersUnplugged.com is the leading podcast within the hedge fund industry. He divides his time between, his hedge fund, his podcast and his family’s charity kidsheart.org. Niels wants to revolutionize the hedge fund industry as well as the way schools are equipped to handle cardiac arrests and other heart related emergencies following his own son’s cardiac arrest in 2011. The bio could be much longer, but in the end, all you really need to know is that Niels is a father, a husband, and a man who cares deeply about, loves, and admires those closest to him and is humbled and grateful for the opportunity to create, to connect and to serve. It's that time of year again...when everyone is thinking about the year ahead. What's 2015 looking like for you? Do you have a clear vision for what you want to achieve and do this year? Today's guest can help you get clear on your objectives for this year. He's someone I consider to be a mentor and he's the man who originally inspired my blog and ultimately my podcast. Today, Michael Hyatt and I talk about the power and importance of setting goals and how to make 2015 your best year ever. Let's be honest...goal setting sounds boring. What’s so important about goal setting? What's the difference between goals and New Year's Resolutions? If goals are so important, why don’t some people, maybe most people, set goals? What are some goals of yours that you hit in 2014? What do you do when you miss your goals? Why is dealing with the past first so important? What do you say to someone who hasn’t dreamed in what seems like forever? Who should we share our goals with? How do you use goals as a filter for what you should be doing throughout the year? From Mark Alan Williams: How does your faith impact how you go about setting goals and what kind of goals that you set? What makes 5 Days to Your Best Ever stand out from the crowd of products that teach goals? Michael Hyatt is a leadership and personal development expert with a lifelong track record of achieving big goals and inspiring others to do the same. He is the author of eight books, including Platform: Get Noticed in a Noisy World, a New York Times, Wall Street Journal, and USA Today bestseller. And, he was recently named one of Forbes magazine's Top 50 Social Media Influencers of 2013. Michael is also the former CEO of Thomas Nelson Publishers, the seventh largest trade book publishing company in the U.S.
Michael is a top-rated blogger on leadership, personal development, productivity and platform-building at MichaelHyatt.com, where he has 500,000 monthly readers, over 235,000 Twitter followers, and nearly 50,000 Facebook fans. Michael has been married to his wife, Gail for thirty-six years. Together, they have five daughters, five grandsons, and three granddaughters. They make their home outside of Nashville, TN. What do you do when you reach the point that your punch-the-clock job is no longer an option? What do you do when you realize that you are virtually unemployable? Today's guest knows exactly what that is like. Eleven years ago, she made the decision to stay at home with her two sons and to start a new business. After many ups and downs, her new vision is to inspire other parents to create their own successful parent entrepreneur lifestyles. She is encouraging others to make the time and the money to be able to raise their kids and enjoy the fruits of their labors. Then Mary is THE go-to expert on the subject. The feeling of thankfulness is not accidental. It's not something that you just randomly discover one day or that you suddenly wake up feeling. Thankfulness comes from practice. It is developed intentionally. In the United States, this is the week that we all are mindful of thankfulness. Perhaps we even share some things for which we are thankful around the table on Thursday, and resolve to be more thankful next year. And then Friday comes. That thankful feeling is replaced by the same mundane feelings of every other day. Thankfulness should be an everyday practice. Thankfulness is directly tied to your levels of productivity and performance, and therefore your success at work, your income, and the stability of your relationships. In short, thankfulness is one of the lynchpins in determining your ability to live out your calling, achieve your dreams, and change the world. So, how can you be more thankful throughout the year? Here are 9 ways. Think back to your darkest days. What were you feeling at the time? What happened as a result? Today's guest has an inspiring story of overcoming serious adversity, some of which he has never shared before, despite recording hundreds of podcast episodes. It will inspire you and teach you. I'm not going to share much of this guest's story, because he tells it so well. Sit back, relax and learn about overcoming adversity, what the true job security really is, and inspiring solopreneurs around the world. So join me in a great conversation with a fellow World Changer, Michael O'Neal. Born in Toledo Ohio (Land of Klinger) and a current resident of San Diego (via Philly, Boulder, Denver, and Brussels), today's guest brought home grammar school report cards that always read: “Doesn’t live up to his potential” and “Talks too much." One of those pieces of feedback would come in handy, as he is now the founder and host of the award-winning and much acclaimed business and entertainment podcast, "The Solopreneur Hour with Michael O'Neal." The show, which in less than one year has already garnered more than 1 million downloads, features lively and highly engaging conversations between Michael and his various (and often much sought-after) guests. I'll let Michael share some of the more amazing details of his life and his story, so make sure to listen to this awesome interview! Have you ever been so exhausted that you just gave up on a goal or dream? Have you ever faced challenges so daunting that you just quit? If like me you have, you don’t look back on that time with fondness, do you? That’s because you know deep down inside that the moment when the exhaustion was at its peak, your goal or dream was within reach. When you let the fatigue become an excuse to give up, you give in to the enemy of your dreams. Call it Resistance. Call it the devil. Call it fear. Whatever it is, when you give in to fatigue, you give up on greatness. Last week, in episode 25, I talked about how to beat fatigue. Exercise, supplements, fresh air, hydration, etc. I shared 11 tips and don’t get me wrong, they are all valid or I wouldn’t have shared them. But there is more to the story than just those. Sometimes fatigue is nothing more than an obstacle that you have to fight through and that’s what we’re going to talk about today. What were you doing when you were 21? Well, today’s guest is truly changing the world…and he’s only 21 years old. Today’s guest is a youngster who makes me feel old. He’s full of energy, doing amazing things, and is out there changing the world. You are going to LOVE his story today. We talk about how he and his brother are helping to save 10,000 people from dying of malaria. Join me in a great conversation with a fellow World Changer, Chandler Bolt. It's that time of year for many of us. We're trying to hit our year end goals, it's cold and flu season, the days are darker and colder, and for people like my retail clients and me, it's just plain busy. So how do you push yourself and not suffer the consequences? I share exactly how to do that in today’s episode. I pushed myself to the brink of disaster. I woke up Christmas morning exhausted, sick, and fifteen pounds heavier than I was two months before. I was at the tail end of a seven-week marathon of ninety-hour workweeks and my body and mind were paying the price. By Christmas morning, I was mentally and physically fatigued. I had a horrible cold that lasted far too long, and my pants didn’t fit very well. I was an absolute mess. Sometimes you have to push. That is a fact of life. There are times that call for extra effort, extra focus, and extra hours. But when you do, it doesn’t mean that your body has to end up in shambles. Today I share 11 things I learned during that rough time and what I am doing differently now. It's not every day that I get to interview my favorite podcaster. Well, that's exactly what I got to do recently. I was honored to recently interview the great Ray Edwards, host of my favorite podcast, The Ray Edwards Show. We discuss overcoming fear, his philosophy on business, prospering with purpose, and how he is changing the world. I hope you'll join Ray and I for this awesome conversation. Ray is a copywriter by trade (meaning he writes sales copy, so don’t ask him how to copyright your new widget). He has worked with some of the most powerful voices in leadership and business including New York Times bestselling authors Jack Canfield and Mark Victor Hansen (Chicken Soup for the Soul), and Tony Robbins. He is also a speaker and author, hosts my favorite podcast, and wrote the #1 Amazon Bestseller Writing Riches. Oh, but there is so much more to this man. There is a book that has been a surprising source of happiness in my life over the past three years. It’s a children’s book that has condensed hundreds of years of psychological research into a book that can be read in less than five minutes. It’s called Let’s Be Happy by P.K. Hallinan and it sums up all that has been said by William James, Martin Seligman, and decades of positive psychologists and other gurus. As far as impact on my life and ability to inspire, I put it right up there with Oh, The Places You’ll Go by Dr. Seuss in the Must-Read Children’s Books category. In today’s episode I share what this book has meant to me and how you can apply its principles in your life. Today, we're going to talk about gossip. If you're going to live out your purpose and change the world, you have to stop gossip. Gossip can derail a mission, cripple an organization, and destroy lives faster than almost anything else can. It's poison...and it must be stopped. But how? If you are overwhelmed at the prospect of stopping gossip, this podcast is for you. It's easier than you think, if you use the four methods I suggest in today's show. Those were the words of the leader of a fast-growing startup (we’ll call him Simon) who was hemorrhaging team members. As fast as he could hire one person, it seemed like two were out the door. What's it like to retire at the age of 27? Austin Netzley knows. Or does he? That's a topic we explore in today's episode along with much more. I always thought I was the smartest person in the room. To me, leadership was personified not by the coach getting hands-on with his team but by icons such as Bill Gates secluding himself in a cabin for a week to think big things. That was my vision…the solitary leader who single-handedly uses his genius to solve every problem, launch every new initiative, and change the world. I would, in my dreams at least, become a superhero, a caped crusader for my causes, and surely everyone would buy in to everything that I wanted to do. The only problem was that I was wrong. Very wrong. That's the topic of today's podcast. I share my struggles with this and the 3 reasons solitary leaders fail at decision making compared to a group. So who exactly am I and why do I call myself (and you) a World Changer? Well, that's what today's episode is all about. As we close down Launch Week, I wanted to spend the last day sharing my story. It's not all that special, if you don't count the 42 years of potential prison, the four firings (once by my own dad), and the countless failures, successes, and amazing breaks along the way. In this episode, you'll see why I say, "My name is Matt and I am a World Changer." What are the habits of the wealthy? They could very well be the same habits that help one to have a great marriage, be a great parent, live a long, health life, and ultimately change the world. I was honored to recently spend more than an hour interviewing best-selling author, Tom Corley about some of the Rich Habits he has discovered and shared in recent years. Tom understands the difference between being rich and poor: at age 9 his family went from being multi-millionaires to broke in just one night. His new book is Rich Kids: How to Raise Our Children to Be Happy and Successful in Life and you can win one of FIVE copies right here. If you want to change the world, there are certain attitudes you must adopt. They are non-negotiable, absolutely essential to success, and you will notice them among all successful people. So what are those attitudes? Well, you'll have to listen to Episode 006 to find out. Farnoosh Brock is a career expert among other things and has an inspiring story. She is an immigrant from Iran (she taught me how to pronounce it correctly). We discuss her four steps to overcoming a victim mentality, how to have an abundance mindset, how to get spousal support for your dreams and goals, and so much more. Farnoosh has an inspiring immigrant story, is a successful entrepreneur, and is helping others to live prolificly. She is definitely a world changer. World Changers, it is your job to see things as they should be first and then put those visions into action. Every great athlete uses detailed, clear, vivid visualizations. I didn’t know it at the time but I learned valuable lessons about leadership success growing up playing golf and working with a sports psychologist. Everything he taught me about golf performance applies to anything in life. Here's what I learned and what I use today. Have you ever heard (or asked) questions like these? If so, then John G. Miller's message on "Personal Accountability and the QBQI" is right for you. You are what you see. You become what you think about. You usually achieve only what you see yourself achieving. Your success as a leader is limited only by what you can picture in your mind. Your income is limited only by how much money you think you can make. Positively visualizing your goals as achieved (in the present tense) is one way to get yourself thinking bigger and living successfully. Here's how to do it.